Certified Boom Repair Certified Boom Repair Services, Inc. Protecting yourself when inspecting a machine with structural repairs. which cannot be determined by visible inspection or load testing as is offered by ASME B30 standards. The first thing to consider is who authorized the repair. The surveyor should require a copy of written directions by the authority that is qualified to allow and/or define the repair method. Some jurisdictions require that the repairs be authorized by the crane manufacturer or a registered engineer. The surveyor is left with the decision as to the validity of the authorizing agent. The surveyor should be satisfied that the material used in the repair is the same as or equivalent to the original material. The material or the specification for the material may be supplied by the original equipment manufacturer. Alternatively, the proper material can be determined by a laboratory analysis of the parent material together with a certified test report with a mill test report from the repair material supplier. 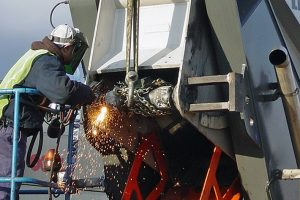 If welding is part of the repair, the welding process should be prequalified or the welding process should be certified in accordance with AWS D1.1 standard. The joint design should be in accordance with the AWS 14.3 standard and the instructions of the authorizing authority. The welding must be done by a welder certified for the process, material, and welding position(s) used. The electrode material must be compatible with the parent material. The welds should be done in accordance with AWS D14.3 and be inspected in accordance with AWS D1.1 standard. In general, the surveyor should require sufficient documentation to verify that the repair has been completed in accordance with the instructions of the authorizing agent. This assurance should include a parent material specification, a material certification for the repair material, a welding procedure certification (if needed), a welder certification document, and a Non-Destructive Evaluation report. The surveyor should load test the element(s) repaired and provide a document to attest to the satisfactory test results. In summary, the crane surveyor should require sufficient documentation for his files to verify that the repair has been done in compliance with the instructions of the authorizing agency. 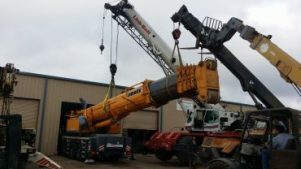 We were interviewed for a recent article by American Cranes & Transport editor D. Ann Shiffler entitled, “Careful consideration required for crane restoration”. Along with Dave Wood, President, Wheco, Inc. Richland, WA and Frank Arthur, branch manager, H & E Equipment Services, Belle Chasse, LA we discuss some specifics on when is the best time to consider crane restoration, what factors can lead an owner to choose this route and what to look for in a service partner while in the decision-making process. Shiffler also asks about the history of both Certified Boom Repair and Wheco so you’ll see some answers to that. People always like to talk about how their company’s started and we’re no different. Read the article here and let us know if you have any insight to add. Newsletter Signup Enter your email address below to receive our monthly newsletter. All I can say good about your men that came up here to work on our equipment is that they are GREAT at what they do!!! They were very professional and worked with confidence, they were a very pleasant crew to work with. As for the work I am pleased with the way it was handled, the lay out and workmanship was very good I’m pleased with it all. Thank you for your quick response and craftsmanship, JOB WELL DONE! We’ve used Certified Boom Repair a number of times over the last 20+ years and are very satisfied with the quality, service, and pricing of thier work. © 2019 Certified Boom Repair. All Rights Reserved.